Chesapeake Bay retriever photo © Keith Rousseau on Wikipedia (use permitted with attribution / share alike). Chesapeake Bay retrievers trace their history to two Newfoundland dogs rescued in 1807 from a foundering ship in Maryland (a red male named "Sailor" and a black female named "Canton"). 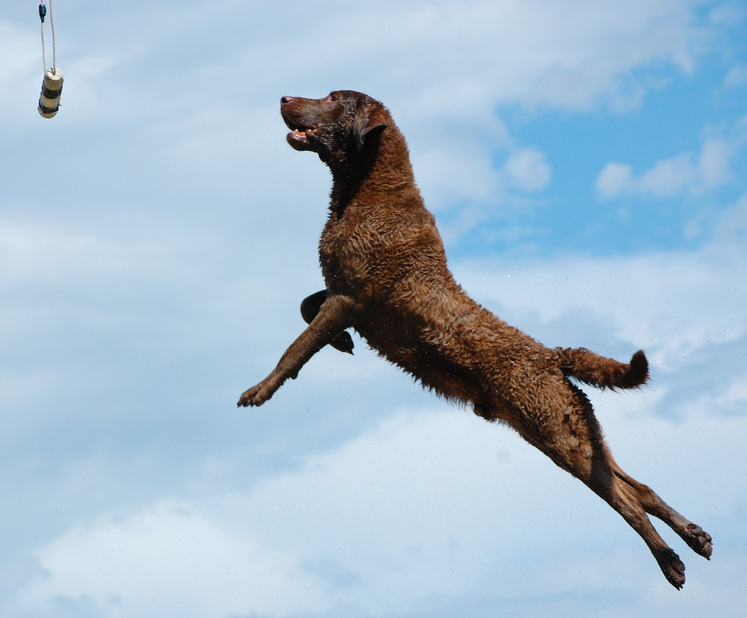 Also called "Chessies," Chesapeake Bay retrievers are willing to work under adverse weather and water conditions, even breaking ice during the course of strenuous multiple retrieves. The Chesapeake Bay retriever is valued for its intelligence, quiet good sense, affectionate protective nature, and a bright and happy disposition (some dogs will 'smile' when happy by baring their front teeth in a peculiar grin). These are strong dogs and have a tendency to be territorial and very protective of their people and property. Chessies are different than other retrievers in that they can be more aggressive, willful and reserved with strangers. There is a saying about these dogs: "You can order a lab; ask a golden; but you must negotiate with a Chesapeake." Chessies are known for their large, powerful chests and a double coat that tends to wave on shoulders, neck, back and loins. Their "waterproof" coat feels slightly oily and is often associated with a slight musky odor. Other distinctive features include eyes that are very clear (of yellowish or amber hue), and hindquarters as high or a bit higher than the shoulders. Three basic colors are generally seen in the breed: brown (all shades from a light to a deep dark brown); sedge (which varies from a reddish-yellow through a bright red to chestnut shades); and deadgrass in all shades (from a faded tan to a dull straw color). The breed standard states that white may also appear on a Chesapeake Bay retriever, but it must be limited to the breast, belly, toes, or back of the feet. 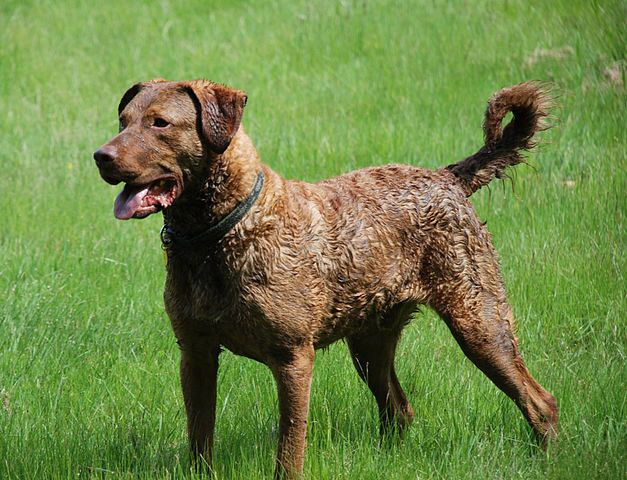 Chesapeake Bay Retriever; photo by Chess on Flickr (noncommercial use permitted with attribution / share alike).